This is probably my favourite outfit that I've put together lately. It's a little smarter than what I would normally wear but still with a few cutesy things thrown into the mix. This soft pink jacket from Warehouse is such a great transitional piece. I'm not ready to don a Winter coat yet so a light jacket like this one is perfect for the current weather. 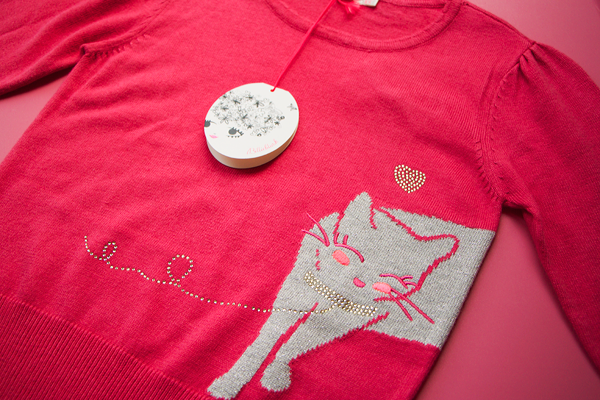 It's very comfy & casual yet helps to dress up an outfit. I'm so glad that I've finally found a nice jacket without shoulder pads because god knows I'm broad enough as it is! I got this blouse from Urban Outfitters last year, it has the cutest crochet collar! 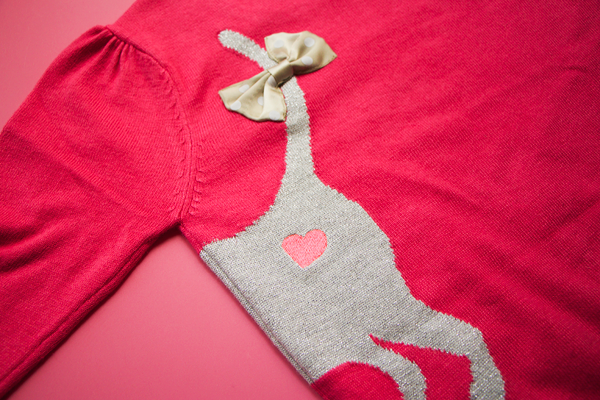 Whenever I want a shirt with a pretty collar, UO is the first place I look. This H&M skirt is quite old too but it's still a firm favourite in my wardrobe. 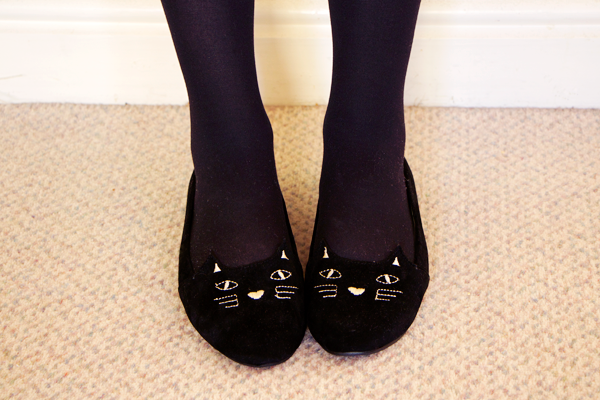 I've gone a bit shoe mad lately & bought these Charlotte Olympia kitty flat knockoffs from eBay. I don't think I could ever blow £500 on a pair of shoes no matter how cute they are so I'm quite happy with these dupes. They were only about £8! Although they look amazing, they smell revolting. I got them a few weeks ago but I've not really been able to wear them until now because they just had such a bad chemical scent. They're okay now that I've aired them out though, just beware if you're planning on buying some! I wore this outfit on Friday to a Macmillan coffee morning. I am definitely not the kind of person who goes to regular coffee mornings as they are basically my idea of hell. It wasn't too bad though as I got talking to some mums from Chloe's new school & it was all for a good cause anyway. I'm trying to spend as little time in the house as possible at the minute as we currently have some wasps living in our ceiling lights! There's a nest next door but the neighbours won't get it treated as it's supposed to be the end of wasp season, ugh. They have been driving me crazy for months & I am starting to question my sanity(!) Filling my living room with Raid every day certainly isn't helping matters. It's been so hard to get any blog posts done as I'm having to kill wasps in between taking photos. So if the quality of my blog has taken a nosedive recently I'm really sorry & hopefully the wasps will leave me alone soon! I've always loved wearing statement watches as they add something extra to an outfit & are probably the only truly practical piece of jewellery. It kinda makes me sad that nowadays people tend to rely on their phone to check the time rather than a beautiful timepiece. 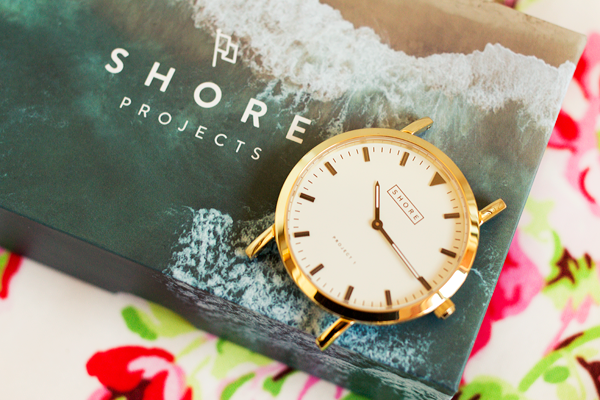 Especially when brands such as Shore Projects are bringing out such classic & versatile watches. As much as I love my Michael Kors 5055, sometimes I want something a little simpler in style & not quite so flashy. 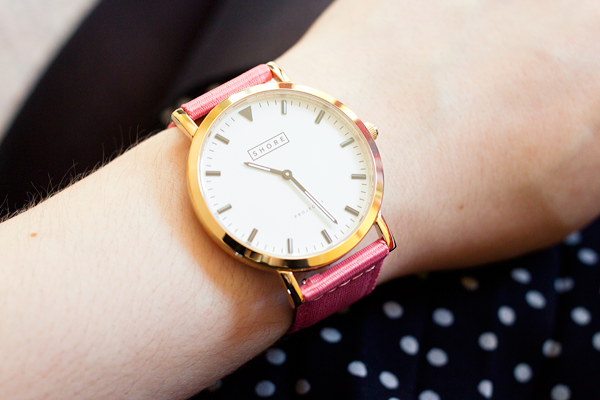 This watch certainly ticks all the right boxes. If you've never heard of them before, Shore Projects are a new British watch brand whose designs take inspiration from the great British seaside. They have created four classic watches, all named after seaside resorts. Each watch has been waterproofed to 100m & features scratch resistant sapphire crystal glass so as well as being a gorgeous wrist adornment, they are extremely well made & hard-wearing. You can choose from a brushed silver or gold rim with a charcoal or white face. I chose the Portland - a gold rimmed, white faced minimalistic watch with a mint green canvas strap and I couldn't be more pleased with it! When choosing accessories I always like to go for items that match my outfit. I own far too many pieces of jewellery in both silver & gold for that exact reason! 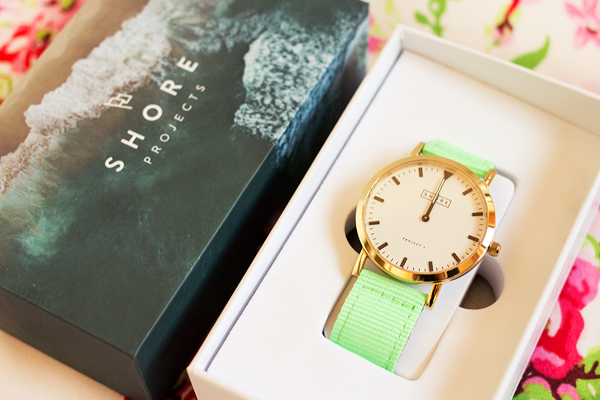 What I like most about these Shore Projects watches is that the straps are actually interchangeable! They're a total dream for anyone who likes their outfits to be matchy-matchy or if you just want something different to wear each day. 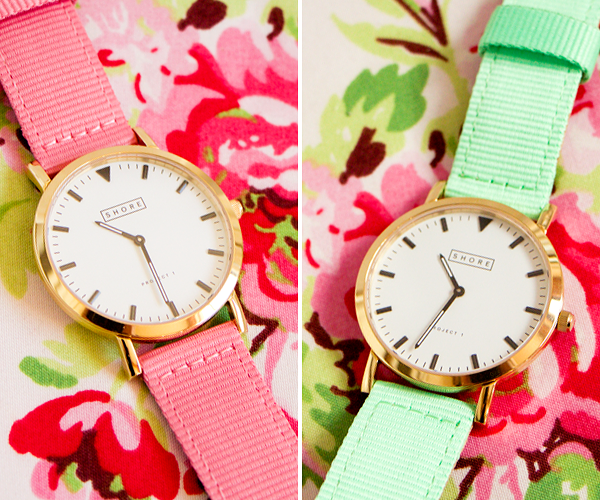 Not only do they have these casual canvas straps (£20), you can also go for a colourful polka dot leather strap (£25) or a plain Italian leather strap (£30). 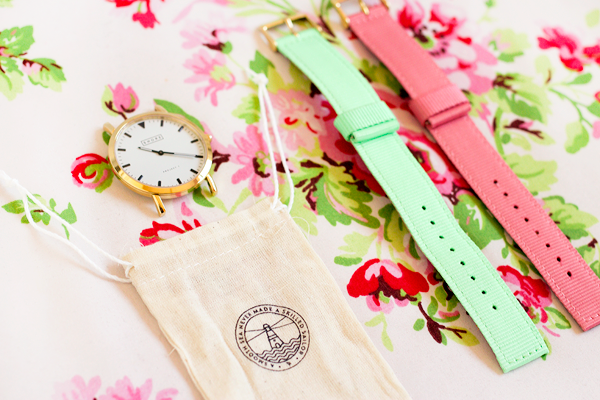 Each strap also comes with a choice of silver or gold hardware to match the watch rim. 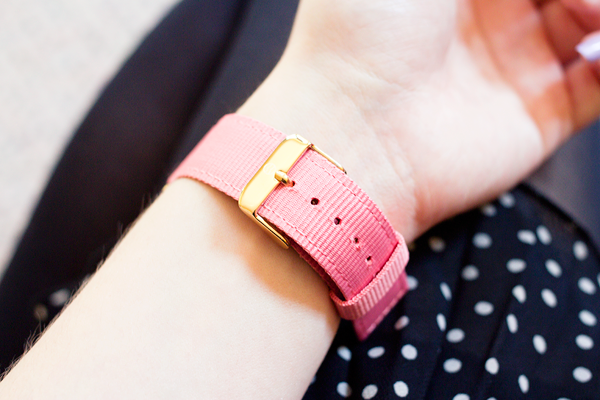 For my secondary colour I plumped for the classic pink canvas strap. 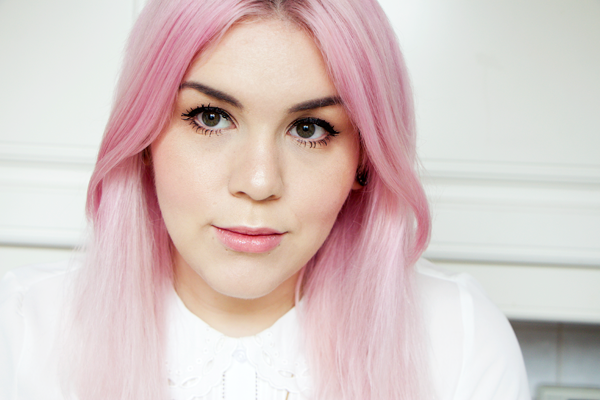 I love pastel colours so both the mint green & pink fit in nicely with my everyday wardrobe. I really want to get the sunshine yellow polka dot strap next, it's so fun & cheery looking! Each watch is completely customisable making them unisex & perfect for any occasion. Changing the straps can be a bit fiddly at first but it still only takes a few seconds. With these interchangeable straps you can practically have a different watch for every day of the week at a fraction of the price. It's such a brilliant concept & with their classic minimalist aesthetic Shore Projects' watches are timepieces well worth investing in. 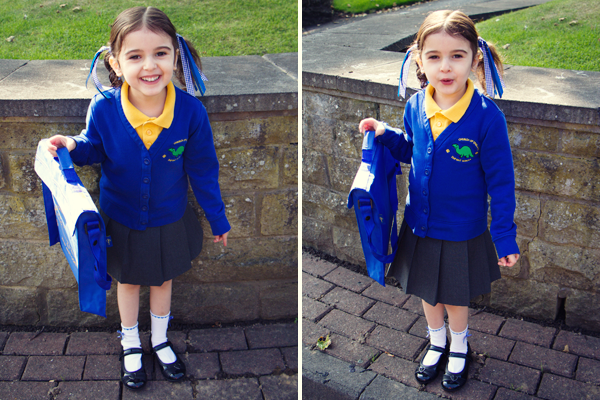 Last Wednesday Chloe had her first ever day at infant school! The last four and a half years have been such a blur. I originally started this blog as something enjoyable to do whilst adjusting to the drastic life changes that came with having a newborn. Now here I am writing blog posts when she's busy learning & playing at school. I never noticed how fast time flies until I had Chloe. It seems like only yesterday that she was unable to crawl, walk, talk, go to the toilet or feed herself but now she's such a big girl & I'm glad that I chose to stay at home so that I didn't miss a single thing. She was only in for the afternoon session on her first day so we had some time to do a quick photoshoot in the morning. I know everyone complains about parents clogging up their Facebook feed with pictures of their child but starting school is such an important milestone & it's been so lovely seeing all the kiddies we know dressed up in their uniforms. 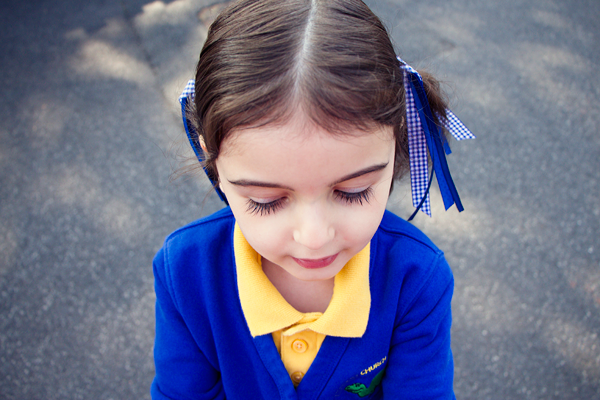 I think she looks beautiful & ever so smart in her school uniform. I had to hunt down bits & pieces of it whenever they were in stock over the Summer. The back to school rush is a total nightmare! 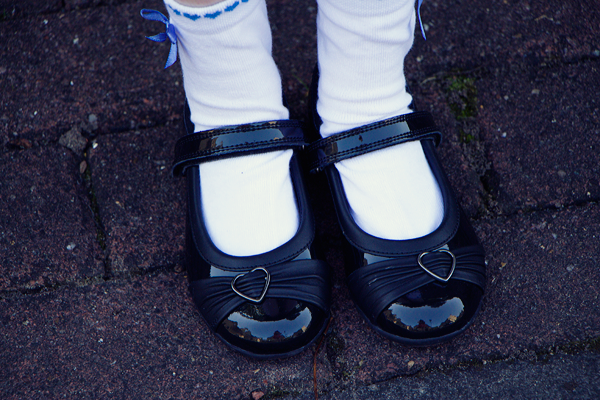 The worst part was trying to buy school shoes as her feet are very small & narrow. Eventually we got this pair from Clarks although she was a bit broken hearted that all the Lelli Kelly shoes were too big for her feet! 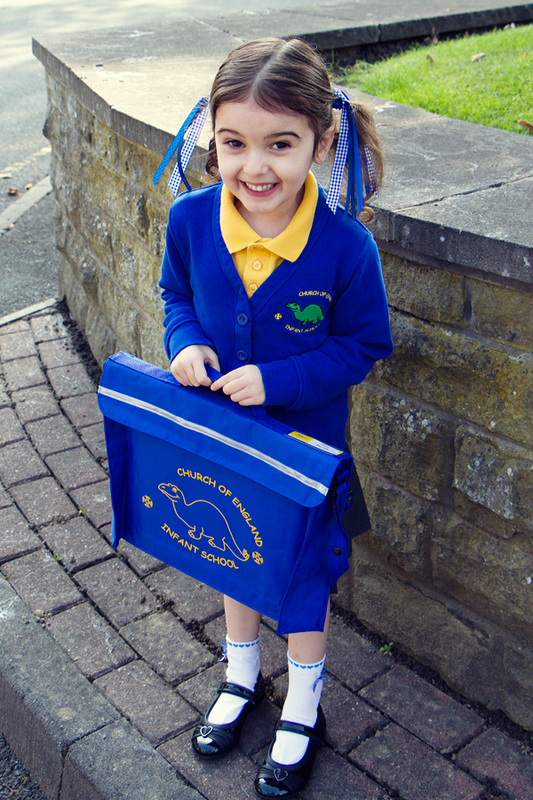 Chloe has been ridiculously excited about starting school for ages now. Ever since she had her last day at preschool back in July she's been constantly asking if it was time to go to her new school yet. This was a day that we've all been looking forward to. She couldn't wait to make some new friends and really wants to learn to read & write properly. She had a little wobble the night before starting saying she was a bit scared & nervous but I knew she'd be alright. I've also been counting down the days as I'd developed a bit of cabin fever. I couldn't go to the gym or do anything I wanted to by myself all Summer long. Once your kids start preschool you get used to having a few hours of freedom each week so the Summer holidays were very tiring. 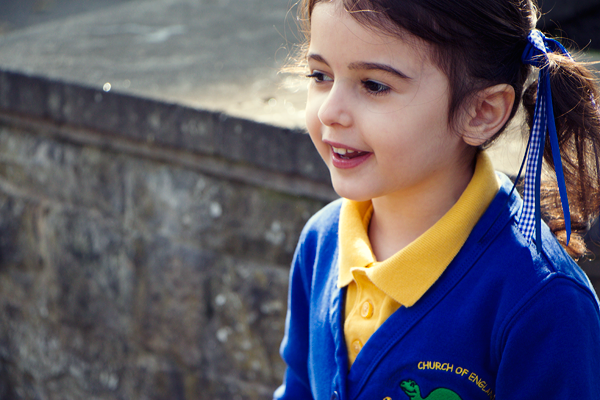 As a parent you definitely have mixed emotions about your child starting school. I've always been overprotective of her & I'm uncomfortable with other people looking after her as I feel like they won't do as good a job as I do or won't care if she gets injured. You can't help but wonder... will they make any friends? Will they grasp what they're being taught quickly? Will they eat their school dinner? Will they manage to go to the toilet on their own? Will they be able to get changed into their PE uniform? There's so many things to think about & it's been quite overwhelming for both of us. I knew in my heart that Chloe would be able to do all of those things though as she's grown up to be such a such clever, friendly and well behaved little girl. I did feel sad leaving my beautiful girl but I didn't cry & neither did she. Her face was beaming from the second we dropped her off to the second we picked her up. Her school doesn't have an attached preschool so she only knew about five other children in her class. I did worry about her settling in with so many new names & faces to learn. But she quite happily hung up her coat on her own peg & put her book bag in her drawer before quickly joining in with all the other boys & girls. Her teachers seem really lovely too so I'm sure they'll be fab with her. It felt strange going home to an empty house again. I tidied & cleaned the house but once I was done it was only about 2pm and I had no idea what to do with myself for another hour! I ended up sitting down and watching daytime TV for a bit, I can't even remember the last time that happened. I couldn't wait to go and pick her up from school. I gave her the biggest kiss & cuddle when she came out of her classroom door. I felt so happy to see her again & relieved that she had enjoyed herself as much as we had all hoped she would. She's been going for almost a whole week now & she's been happy at school every single day. She was a little bit disappointed when she found out that she couldn't go to school at the weekend! 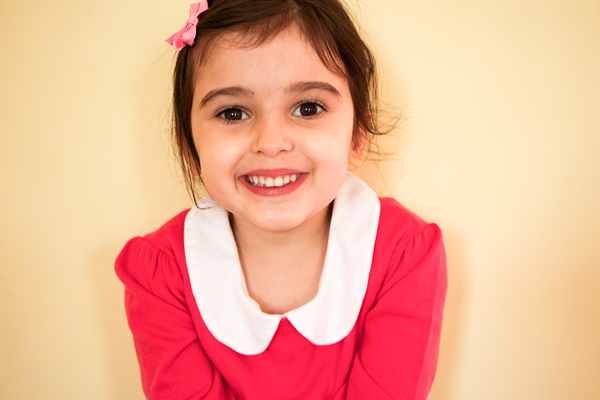 I always look forward to getting my little girl back at the end of the day & finding out what she's been up to. She's been coming home with loads of brilliant drawings & creations so I think her skills have improved already. I hope she continues to love the educational experience & makes lots of new friends there. I'm just so incredibly proud of her & will miss being with her all the time. I love my little Chloe girl so much! On the Monday of the week she started we decided to have one final treat day together. We love our days out shopping & I'm sure we'll both miss being able to travel to different places on the train whenever we feel like it. We went off to Leeds for a meal at Yo! Sushi which is Chloe's favourite restaurant. We've been there so many times together now that she can even use the adult chopsticks properly! Then we popped into The Entertainer & I bought her a cuddly Fluttershy from My Little Pony. House Of Fraser kindly sent over a voucher so that I could treat Chloe to some new clothes. 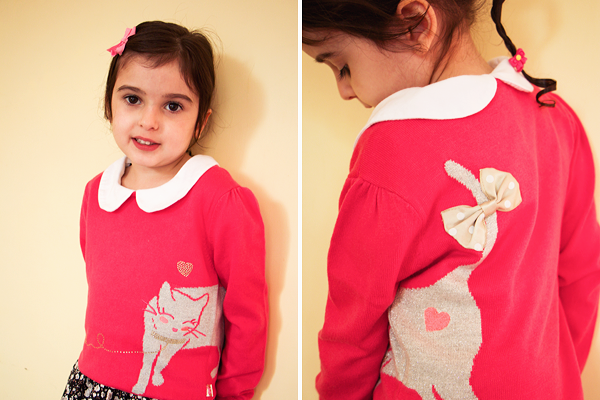 I let her have free reign in their Leeds store and she chose this adorable pink kitten jumper by Billieblush. I love the cute little bow on the tail! She's a fashion blogger in the making haha! Bleach London & I had a pretty rocky start to our relationship to say the least. I remember being so excited about the launch of their dyes into Boots last October... and then the horrendous purple/blue/green mess of Parma Violets happened which stayed in my hair for six. whole. months. Since then I've come to realise that if you ignore the terrible quality of their dyes then they actually make some brilliant & fairly cheap haircare products. 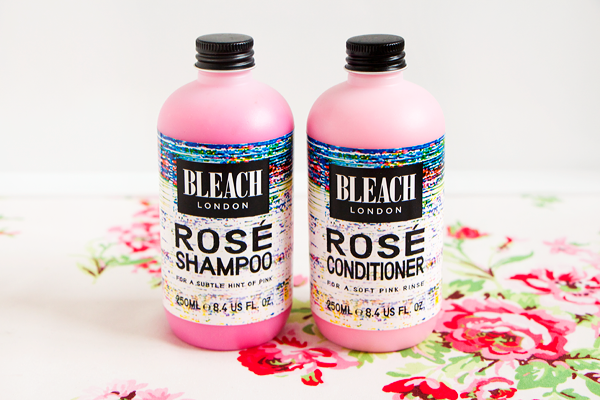 They recently brought out a few new additions to their range including their Rose shampoo & conditioner. I always find myself going back to a pink tint when I get my hair toned so I figured I'd give them a whirl. Although it's super easy to whack a blob of dye into whichever shampoo & conditioner you're currently using (and I would recommend doing that to prolong the colour of any dye job) these are the first pink toned haircare products on the market. They're also very convenient, readily available & only cost £6 per bottle. I really like the formula of these products. The shampoo cleanses well & the conditioner is incredibly nourishing. 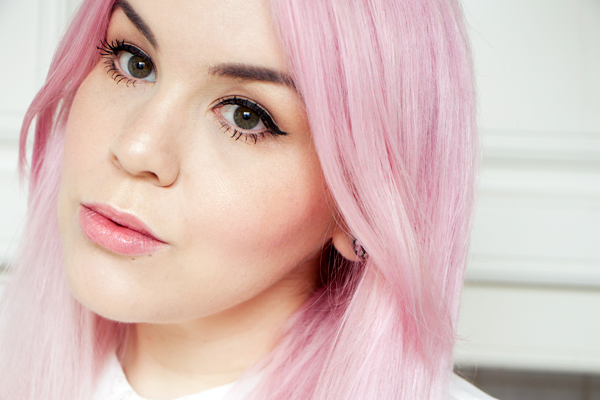 I have to commend Bleach London on how soft their products make my hair feel & how shiny my hair looks afterwards. If you already have pink hair then these can be used to intensify the colour. I never got round to using my Rose dye but other reviews I read seemed to mention how quickly that particular dye faded. These would be perfect for topping up that colour and making your hair look more even toned. In fact I would recommend just using these for all over colour instead of bothering with their pink dye at all. On light blonde hair this duo gives a hint of a tint that can be built up by washing with them continuously. You don't need to use them together either. 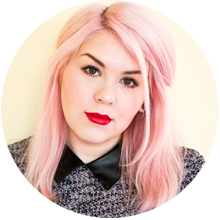 I started off just using the conditioner & that alone imparted a soft pink tone to my hair. If you're a bit nervous about dyeing your hair a weird colour then these would be a great way of easing yourself into the world of pastel locks. Above you can see how my hair looks after just two washes with both the shampoo & conditioner. I'm very pleased with the results & I'm loving my hair colour at the minute. Apparently they can also knock out any green tones that you might've developed from using some of Bleach London's dodgier products. If only they'd brought these out last year eh? The last time I went to the hairdressers I discovered that they had set up a DIY nail bar so that you could spruce up your nails whilst waiting for your colour to develop. It's such a genius idea & I had a lot of fun playing with all the products. I'd never tried nail drying drops before but one use was enough to convert me. At the salon I used the Essie Quick-E Fast Drying Drops but when I went to Boots afterwards I spotted this Bourjois version which was a bit cheaper. This product is basically a clear liquid that you drip onto your nail beds with the pipette to dry them off in a matter of seconds. I never have time to sit around waiting for my nails to dry properly so products like this are essential to me. I use a couple of drops per nail to make sure that everything has been covered & my polish dries off super fast. The oily texture also nourishes your nails & cuticles so it's a brilliant way to finish off your manicure. 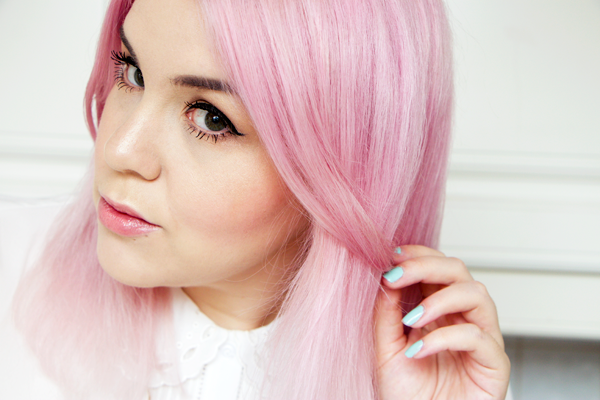 I absolutely adore Bumble & Bumble's Hairdressing Invisible Oil. It makes such a difference to my damaged hair. That magical blend of coconut, sweet almond, grapeseed, safflower seed, macadamia nut & argan oils literally works miracles. Bumble & Bumble recently expanded this line by bringing out three new products. I think that their shampoos & conditioners are way too expensive but their styling products are little bit more affordable. I recently got the new Invisible Oil Primer for my birthday and I was instantly wowed by how much softer, shinier & generally more amazing it made my hair. This product has such a huge list of benefits, it basically does it all! It's main use is to offer protection against heat & UV damage, thus reducing breakage. A few spritzes of this lovely light mist all over my hair helps to detangle, soften, defrizz & tame flyaways. My hair is so much more manageable & easy to style. It totally transforms dry & dull hair and I don't think I could give up using this product anytime soon. I'm not sure whether I prefer this or the original oil but you'll probably get on better with the primer if you have very fine or greasy hair. There's nothing better than a trip to Lush when you're in need of some quick pampering. One of my favourite treats are their body conditioners. I can hardly ever be bothered to moisturise my body when I get out of the shower so I prefer to rehydrate my skin when I'm still in the bathroom. After washing your body you simply massage this creamy concoction all over & then rinse it off. This conditioner is made from an indulgent blend of shea butter and cocoa butter along with almond oil, moringa oil & marula oil to deeply moisturise the skin. It feels so wonderfully hydrating without leaving any greasy residue. Lush have also included mango juice to brighten the skin and aloe vera to cool & soothe. It makes my skin feel softer than ever before & imparts a beautiful sheen that makes my limbs look nicely toned. Best of all this stuff smells absolutely incredible & the tropical scent stays on your skin all day long. 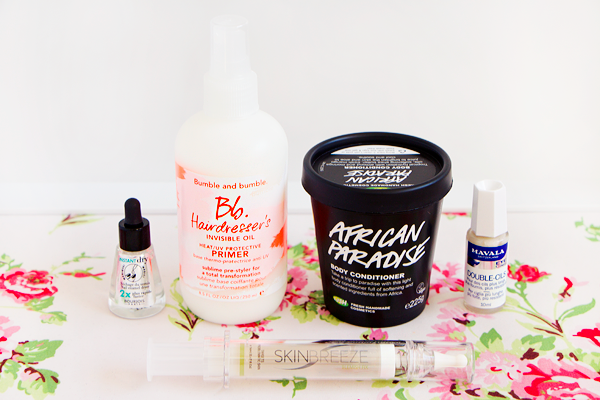 African Paradise is probably one of Lush's most expensive products but by golly it's good! I'm forever trying out new lash growth products as I feel like my eyelashes aren't quite as long & lustrous as they once were. My mascara picking habit certainly doesn't help things as I often get unsightly gaps along my lashline. Some of the ingredients found in these kind of products can be quite scary & expensive to boot. I prefer to use things with natural active ingredients like Talika Lipocils & Indeed Labs Peptalash. I've always heard amazing things about this Mavala offering & it soon managed to find it's way into my shopping basket. I've been using this every morning before mascara & every night before bed for the past month. As a result my lashes are looking much fuller & thicker. They seem a bit stronger now too as I haven't had as many come out when picking off mascara. I wouldn't say they look much longer but I feel like their overall condition has definitely improved. The mascara wand style applicator is much better than those thin eyeliner brush style ones. It thoroughly coats each lash & can be used on eyebrows too. I love dual-purpose products and that's why I can't get enough of this Blemish Fix serum from Skinbreeze. The combination of hyaluronic acid with salicylic acid is a dream come true for acne sufferers. This light watery serum will help to rehydrate your skin & fight blemishes at the same time. Salicylic acid exfoliates inside your pores, unclogging them to reveal clearer skin. It also has anti-inflammatory & mild antibacterial benefits. Regular use of a BHA product can reduce oil production but one downside is that it can also dry out the skin. That's why this serum is so lovely to use as the hyaluronic acid stops your skin from getting dry. Blemish Fix also contains seaweed extract to help soothe the skin. It's a very gentle yet incredibly effective way of clearing up blemishes. I normally use this serum in the morning before my moisturiser as I use an AHA in the evening. I like that I can use this under my makeup as way of fighting spots throughout the day. It's the kind of thing that would make a wonderful addition to any skincare routine.